The previous data I have on aging covered 10 days, and now I want to come back to this now that more time has passed. This data is from the same Pi Hat hardware as that post. The datasheet specification for aging with these TCXOs are +/-1ppm/year. I've corrected for temperature effects as explained in a previous post. The two aging estimation lines I added have a slope of 0.71ppm/year. Aging isn't a straight line, but makes an ok fit in this time scale. 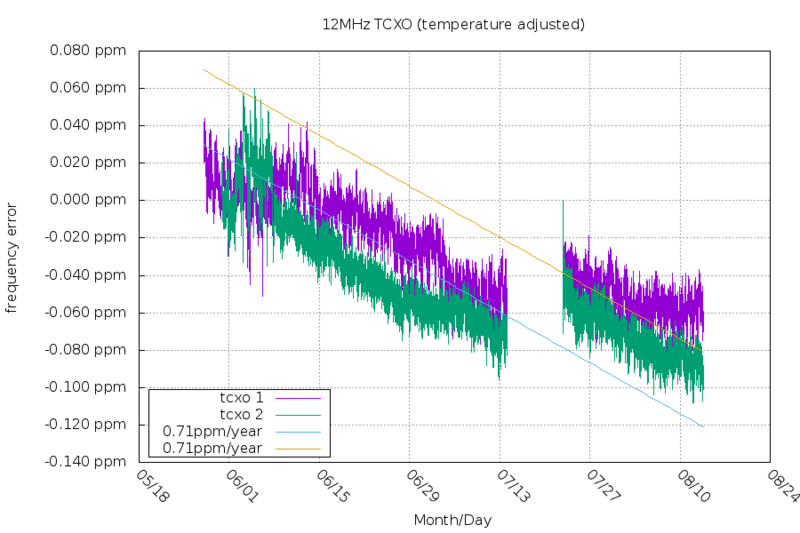 I turned both TCXOs off for a week in July and you can see that caused its own change as well (the term for it is "retrace"). The two estimation lines track the before and after data sets. Assuming this aging rate stays constant and linear (and it won't, but it's a useful estimation) this would result in a 11.2s drift this year. The Connor-Windfield paper below explains that the rate of change slows down after the first year, so that's something else to expect.